A better day. I had breakfast and bought some groovy sunglasses in Breckinridge and caught the sun, because it was sunny. Left the hotel at 06:45, which is stupidly early, but I was never going to get any sleep. Jump on I-70, through Denver without seeing any of it and off to bag some peaks. First up was Berthoud Pass, which I've done before. A nice little opener at 11,315 feet according to Wikipedia or 11,307 according to the sign. Further altitudes will be given from the former as they are reckoned to be more accurate. 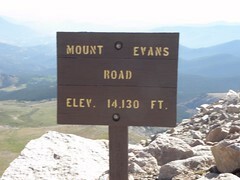 And now to Mount Evans, which is the highest paved road in North America. 14,160 feet. I'd tried it before, but the top section is closed after Labor Day - which is tomorrow - so I didn't get all the way up last time. Back down the dead-end road and turn left over Warrior Mountain Summit. 11,130 feet, but you'll have to take the TwatNav's word for it as there's nothing marking the highest spot. On to Kenosha Pass, 10,001 feet. At the far side of which an oncoming madman in one of those nasty little Far Eastern square things (Nissan, Kia, Honda, Daihatsu - they all look the same) decided to overtake on a not-blind corner, in spite of a Mr Larrington approaching at or near the speed limit. Mr Mad decided that the only way to avoid me was to steer even further left onto the verge, and missed rolling into the ditch by about three inches. The roads are unusually full this weekend, with it being a Bank Holibob. And unusually full of idiots at that. And roadies. Mad ones, climbing huge mountains. 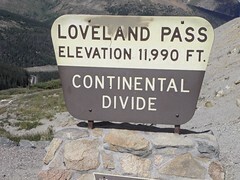 After Kenosha it's Hoosier Pass, at 11,541 feet, followed by Loveland Pass at 11,990. This one is the approved route for big rigs too tall or dangerous to go through the Eisenhower Tunnel. Which I did, but you'll have to take my word for it as with it forming part of I-70, there is nowhere to stop for a photo-op. Hang a left at the bottom for the 11,318 foot Fremont pass, then sharp right and back towards I-70 for the 10,424 foot Tennessee. Finally back onto I-70 for a quick sprint up to 10,666 feet on Vail Pass, before turning round and heading down the valley to Eagle for the night. Only 6,600 feet. Now I am fed and watered with Fat Tire Amber Ale from up the road in Fort Collins. Night all.